This is a new picture to be found on the front gate of the North Korea embassy in Beijing, which I am offered to admire every day, on my way to office. 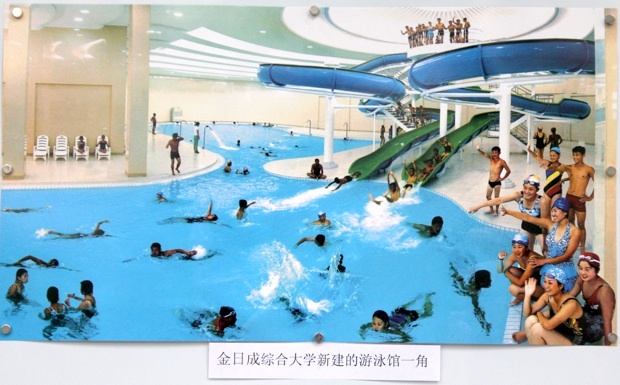 It shows an amazing swimming pool at Kim Il Sung University in Pyongyang. Looking at all the details, i can only wonder what or who, in this picture, has not been “photoshoped”… Which reminds me the “Kill notice” sent by AP last Sunday on another DPRK picture. 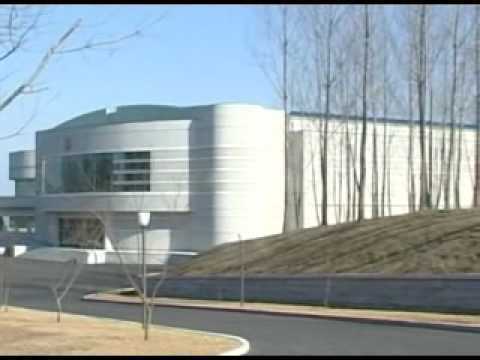 “The swimming complex built on the personal initiative of Kim Jong Il has a large swimming pool and wading pool. They have been built in such a peculiar style that they not only offer the teachers and students an ample opportunity of training their bodies and enjoying cultural rest but can host international competitions“. “Kim Il Sung University, the first genuine university for people established in the country on the personal initiative of President Kim Il Sung and under his guidance, has turned into a leading university in the world, he noted, adding that the WPK and the people are highly proud of having the prestigious Kim Il Sung University, the highest seat of Juche-oriented education. He highly appreciated the shining exploits performed by the university, saying that the university is, indeed, one of great merits as over the past 60 odd years it has trained a large number of revolutionary talents in the crucible of the arduous revolutionary struggle, thus successfully playing a pivotal role in carrying out the policy of training native cadres and the policy of intellectualizing all members of the society, and actively conducted scientific researches, making a great contribution to the development of the nation’s science and technology“. This entry was posted in north korea, photos. Bookmark the permalink.